Much of the present day Chequer Street was by late Medieval times the Malt Market or Malt Cheaping, with at the upper end of the street the Hay Market. At times part of this street appears to have been included in St. Peters Street and Haliwell Street. The present name is taken from the medieval inn with the sign of the Chekkre (Chequer). On the western side of the street in the early 16th century was the house of the Master of Spicery of the Abbey and that of the Keeper of the Abbey Guest House and behind these some houses belonging to the office of the Sub-Cellarer of the Abbey. 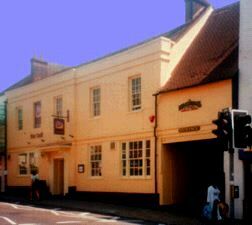 It was between the sign of the Key (later The Cross Keys) and the Chekkre that Warwick's troops broke into the town in 1455 during the First Battle of St. Albans having crossed Tonman Ditch and traversed the town's backsides. On the eastern side of the street a number of timber framed buildings survive in various states. Most of these seem to belong to the 16th century and were probably constucted after the dissolution of the Abbey. One certain exception is the building which spans the carriageway which once led to Bell Yard and now leads to the Maltings shopping centre and in that part of the Bell immediately to the north some heavy timber in the cellar is probably of a similar date. On the Western side of the street a range of buildings which existed until the early years of the 20th century seems from photographs buildings which originated as medieval shops as found elsewhere in the Market place.